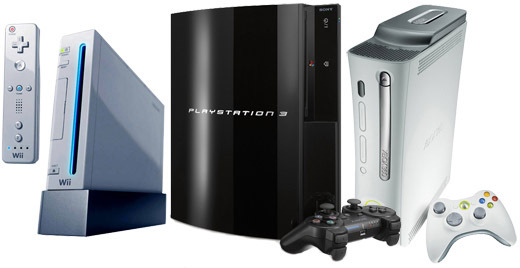 Here are my beloved consoles. At present times, i only own Sony PlayStation 2, Sony PlayStation 3, Sony PlayStation Portable, Nintendo Gamecube, Nintendo Wii, Microsoft Xbox and Microsoft Xbox 360. I will try to post the specs for each and every one, but i like to think that hardware performance is nothing without feeling, gameplay, music, story… Something that, for example, Final Fantasy series will always have. After all, why do we play on these little machines ? We do it to escape out of this world. We do it to relax, to have fun with friends (or enemies). We do it for the nice or scary moments inside the games, and not for the hardware under the hood. I think those that only think about the hardware power, poligons, pixel or vertex shaders, will soon forget about what a game should be.